Consistent line height between both sections would be nice. 2279.diff​ (802 bytes) - added by Ipstenu 2 years ago. meta-2279.png​ (105.8 KB) - added by coffee2code 2 years ago. Looking into this, it's actually because the Committers have an email. If we change this from 0.5em to 1em it looks better. Not perfect, but better. 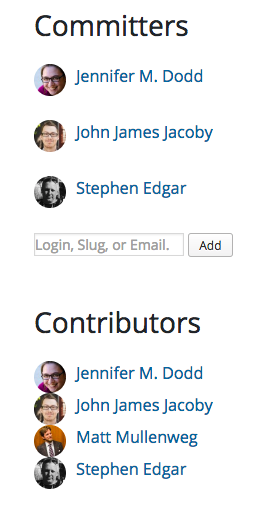 meta-2279.png​ reflects what the Committers and Contributors section look like in the plugin's admin. It appears as though the spacing issue originally reported has since been fixed (the contributors are no longer all bunched up). As Ipstenu noted, each committer has a little extra vertical spacing due to display of email addresses. Closing this as fixed since it now looks fine. Feel free to reopen if anyone disagrees.